OxiClean Concentrated Crystals Dishwasher Detergent tackles the toughest baked-on and greasy messes! Each convenient oxygen-powered pak eliminates: Scrubbing, Stuck-on Food and Film & Spots. 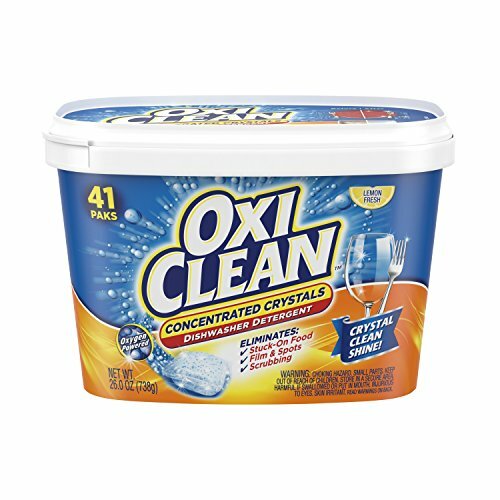 OxiClean Concentrated Crystals Dishwasher Detergent leaves your Dishes with a Crystal Clean Shine. Give your dishwasher the power of OxiClean! If you have any questions about this product by OxiClean, contact us by completing and submitting the form below. If you are looking for a specif part number, please include it with your message.